1. Provide the recipients name and address where this will be shipped. It's really that simple. TIY will gauge the time we need to ship based on where it's going and we will ship accordingly. We guarantee it will be there before Mother's Day. At checkout, please provide the recipient's name, address, what you'd like the special note to say, along with the approximate date you'd like them to receive it. We don't guarantee exact date of delivery but we do ship FedEx Home Delivery and they are accurate within a day or two. We will then customize the ship date based on this for you, making sure it's before Mother's Day (the custom shipment dating here only applies to Mother's Day orders only). If you have any questions, please don't hesitate to ask!! 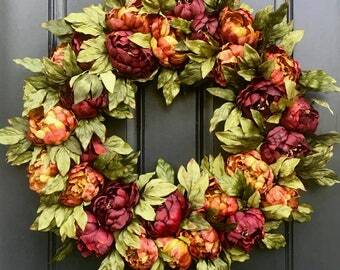 TwoInspireYou is THE destination for the greatest variety, highest quality and most lifelike artificial handcrafted wreaths you can find for Every Season and Every Reason. We introduce new and unique front door designs each month. Join our mailing list to be the first to know about the newest and latest, any SALES events, special offers, or promotional codes!! Email us at twoinspireyou [!at] gmail.com. 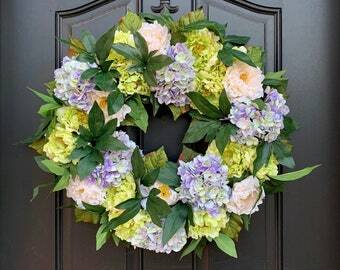 FOR THE FIRST TIME, we are introducing 36" and larger finished wreaths. So many customers have asked for bigger wreaths and we are finally ready to accommodate! We will slowly add them to each listing but if you're looking for a larger wreath sooner, please convo us and we'll get a listing started for you! PLEASE NOTE: Our current create and ship time is 2-3 weeks. We will not compromise on quality and construction, so please understand that we may delay a day or two on shipping to ensure the best product is delivered to our customers. 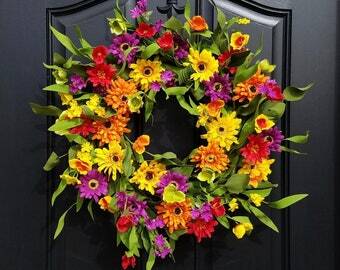 A SPRING WREATH on your front door is the perfect way to celebrate the beauty of the season! All of our wreaths at TwoInspireYou are hand-crafted for each customer at our shop in St Charles, Illinois. We value the importance of handmade decor and offer quality craftsmanship at reasonable prices. 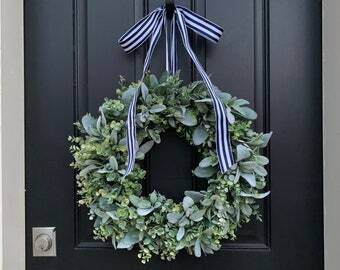 Wreaths make the perfect wedding gift, new homeowner's gift or thank you gift. We are happy to send the wreath and a special note directly to the recipient! At checkout, please let us know the recipient's name, address and the special note you'd like to go along, and we'll take care of the rest! We'll let you know when it ships and provide a tracking number for you as well. 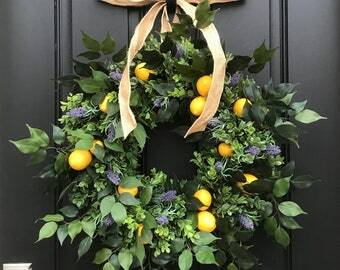 We have the largest selection of beautiful, handcrafted Spring Wreaths, Summer Wreaths, Square and Round Boxwood Wreaths, Monogram Wreaths, Wedding Wreaths, Holiday Decorations, Floral Baskets, Floral Wall Pockets and Year-Round Wreaths. You can find TwoInspireYou premium wreaths featured in: This Old House Magazine, RedBook Magazine, HouseBeautiful.com, ElleDecor.com, TownAndCountrymag.com, Countryliving.com. Goodhousekeeping.com, Womansday.com, Styleandcheek.com, BrightBoldBeautiful.com, GreenwichGirl.com, and many other amazing blogs, magazines and specialty shops. Many thanks to our loyal customers and those who have pinned, posted, tweeted, and blogged about our unique creations! We usually ship FedEx Ground so you should receive your package within 1-4 business days after shipment, provided you live within the continental US. If you'd like expedited shipping (extra charge), please let us know. We will do our best to accommodate your needs. If you reside outside the continental US, please contact me for current ship times and pricing. If you have any questions, please don't hesitate to convo me directly. I will make sure to get back to you ASAP. Absolutely love it. 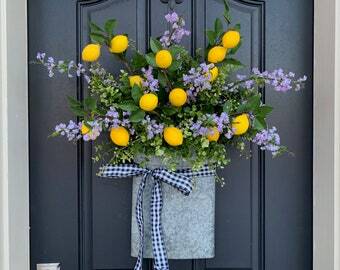 The lemons really pop against the dark green boxwood and my black door. Easy transaction. Shipped on time and arrived quickly once shipped. Packaged nicely. I’m so happy with my wreath ! I have ordered from this company before and their products are beautiful ! Thank you so much ! Beautiful item. Arrived on time and packaged well. Would recommend and I will order from them again. Getting ready to post several Fall/Thanksgiving wreaths ON SALE!! Stay tuned!!! Some great discounted wreaths!! Another new design getting ready for the Christmas season! Can't wait to post!!! What a beautiful season for "Hope", and we also have a limited supply of "Wish", "Winter", "Believe" and "Snow". Stay tuned!! 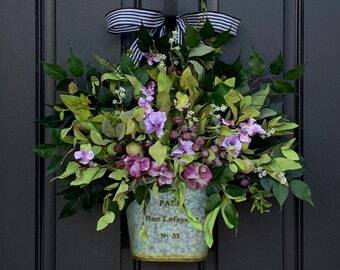 All TwoInspireYou wreaths and hanging baskets are original! Each piece of art is custom created from start to finish. 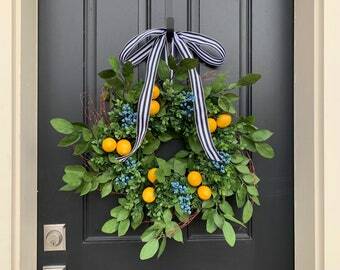 For EVERY SEASON and EVERY REASON, front doors with a TwoInspireYou wreath tell your story! TIY offers the most unique and custom materials, designs and beauty that you won't find anywhere else on the planet! TIY has a passion for creating beautiful things. 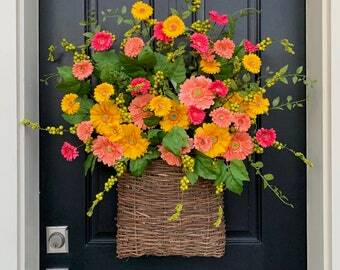 Let us help you bring life to your front door! Your front door tells a story. What story does yours tell? Your front door reflects the heart of your home; it’s the first thing people see when they enter and the last thing they see as they leave. 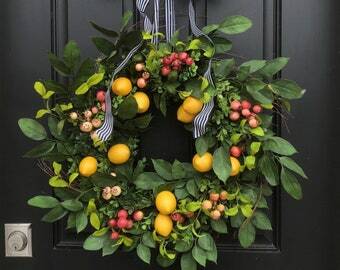 A wreath on your door gives visitors a sense of what’s inside, inviting them to come into your home and experience the life within. Your front door tells a story. What story does yours tell? 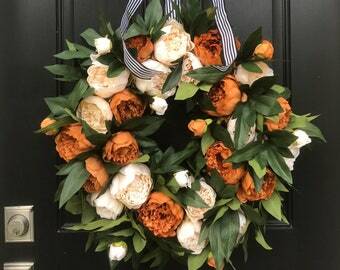 TwoInspireYou seeks to help you tell that story by offering unique and beautiful wreaths, with designs that span from traditional to modern aesthetics. 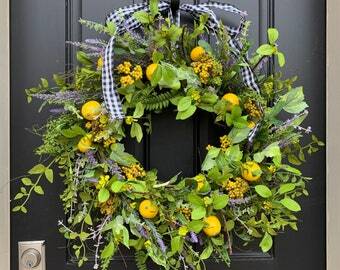 Each wreath is arranged by hand using the highest quality materials. 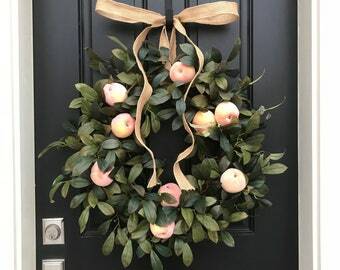 A one-of-a-kind piece from TwoInspireYou forms the foundation of an inspiring entryway that celebrates the memories created within your home throughout every season of the year and every season of life. TwoInspireYou was founded on the belief that inspiration is born when craftsmanship and nature’s beauty unite. This combination results in the creation of something truly beautiful and unique, much in the same way that life blossoms when we welcome family and friends into our homes and make memories filled with laughter, imagination, love and joy. We hope you see our wreaths as a beautiful way to tell the unique story of the life found inside your home. I am the owner and designer behind twoinspireyou. Thanks so much for your interest in my wreaths! 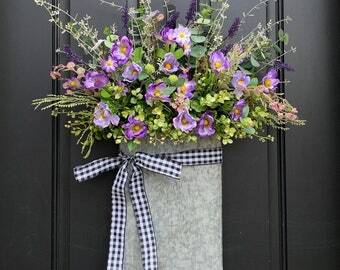 I really love what I do and am committed to creating beautiful and unique (often one-of-a-kind) arrangements that look lovely on any door or in any room in your home. 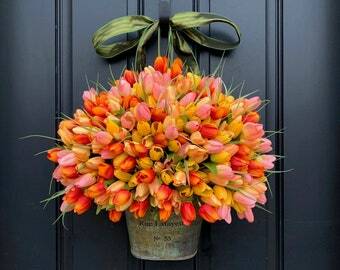 For me, an arrangement on the front door of a home speaks of what's on the inside. My greatest hope for my creations is that they inspire, giving a sense of love, joy and peace to a home. I commit to always creating my arrangements with the highest quality materials that I can find and making sure the construction is very secure. Because I seek to use the most lifelike florals on the market, some of the materials in my wreaths are not fully weatherproof, therefore, I cannot guarantee the lifespan of a wreath placed outdoors. For more details and tips to ensure the longevity of your outdoor wreath, see the "Additional Information" section below. If you have any questions or concerns, please don't hesitate to convo me or email me at twoinspireyou [!at] gmail.com. **While I may sell several of the same wreath, each one is made by hand in my shop with great attention to quality and detail. I always do my best to create with the exact materials shown in the photos but may need to substitute due to manufacturer change in materials or an unforeseen quality issue with current materials. If you have any questions or concerns, please don't hesitate to ask! If you are unhappy with your purchase and would like to return it, please contact me within 3 days of receiving your wreath so we can remedy the problem or further assist you with the return process. Once arrangements are made, please ship it in the original box provided to the return address shown, within 7 days of receiving it. When I receive the package, I will immediately refund your original payment minus shipping charges. If you received "free shipping" on your order, shipping charges of $21.95 will be deducted from the sale of the item before we issue a refund. Thank you for your understanding. Exception: Custom and holiday wreaths (Valentine's Day, Easter, Fourth of July, Thanksgiving, or Christmas) are nonrefundable if the wreath arrives within 10 days of the specific holiday. If your wreath is damaged during shipping, please notify me immediately upon receipt so I can address the situation. Please email me with any questions about my wreaths or shop policies. Attention ILLINOIS customers: I will be charging 7.5% sales tax on all purchases. Thanks for your understanding in this matter. If you have any questions, please feel free to convo or email me. I use FedEx Ground or FedEx SmartPost for all continental US shipping. For shipping OUTSIDE the continental US, there are almost always additional fees. I will contact you and set up an Etsy listing for the additional charge. Thank you for your understanding. I will do my best to ship within 2-3 weeks, once payment is received and the funds clear. Please understand that during these peak times my shipping dates may be extended without notice but I will ALWAYS do my best to create and ship within the timeframe given. Please don't hesitate to ask if you have questions about this. When I ship via FedEx, I do not require signature at delivery. If you would prefer signature service, please contact me before checkout. ALSO: If you decide you want to return your wreath, shipping charges will be deducted from the sale of the item whether you received "free shipping" or not. Thank you for your understanding. Thank you so much for supporting twoinspireyou. I hope you love my creation and are inspired by it. I look forward to sharing more with you in the future. **While I may sell several of the same wreath, each one is made by hand with great attention to quality and detail. I always do my best to create with the exact materials shown in the photos but may need to substitute due to manufacturer change in materials or an unforeseen quality issue with current materials. If you have any questions or concerns, please don't hesitate to ask! PLEASE ALSO NOTE: When purchasing two wreaths for double doors, I will create the wreaths and send the ribbon for you to attach the bows. 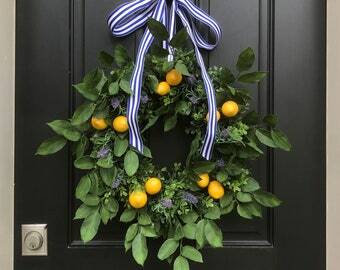 I do not tie the bows on the wreaths, as doors, hangers and placement of the wreaths can vary. If you have any questions, please contact me. Does the wreath come with the ribbon in the picture? Yes, if you see a ribbon on the wreath in the picture, your wreath will come with that ribbon unless you request otherwise. Do you offer discounts, have sales or have a promotional code I can use? Absolutely. Please convo me and give me your address and I'll get a shipping quote to you asap. I don't generally offer this service on my listings because each country's shipping charge is different due to my box size being rather large. Are Valentine's Day, Easter, Fourth of July or Christmas wreaths returnable? Any holiday wreath is returnable up to 5 days prior to the specific holiday the wreath was originally created for. Also, Twoinspireyou MUST be contacted to arrange such a situation. The wreath must then be returned in the original box and with the original packing material within 2 business of arrangements being made. Once TIY receives the wreath back, we will refund customer what they paid MINUS any shipping charges. If you have any questions, please don't hesitate to ask via Conversations.